GiveWell aims to find the best giving opportunities we can and recommend them to donors. We tend to put a lot of investigation into the organizations we find most promising, and de-prioritize others based on limited information. When we decide not to prioritize an organization, we try to create a brief writeup of our thoughts on that charity because we want to be as transparent as possible about our reasoning. The following write-up should be viewed in this context: it explains why we determined that (for the time being), we won't be prioritizing the organizations in question as potential top charities. This write-up should not be taken as a "negative rating" of the charities. Rather, it is our attempt to be as clear as possible about the process by which we came to our top recommendations. Can the organization provide compelling evidence that its program has significantly increased recipients' incomes or otherwise improved their quality of life? For this type of organization, we primarily seek evidence from randomized controlled trials. When we consider other evidence, we focus largely on the discussion of the counterfactual: i.e., what alternative, non-program factors may have caused the observed rise in incomes? Can the organization demonstrate a track record of using charitable funds to create self-sustaining institutions without the need for charitable funding? After considering many organizations and reviewing the literature for organizations in this cause (economic empowerment, agriculture, and microfinance), we have not found examples of programs that convincingly address the above questions and have therefore de-prioritized this cause as an area of investigation because we believe other causes (such as global health and nutrition and other areas) are more promising. We concede that microfinance may have had substantial success along the lines of our second question, but are skeptical of the degree to which more philanthropic funding is needed at this time; we recommend David Roodman's book Due Diligence as a more thorough examination of this question than we have done. KickStart and VisionSpring do not, in our view, convincingly answer the questions above. We spoke with VisionSpring in July of 2012, and published a summary of our notes from that call. We previously reviewed VisionSpring in 2007 and 2009. We previously reviewed KickStart as part of our 2007-2008 report on international aid. 1. Note that our top-rated charities do provide goods (not cash), but we believe in their cases, the evidence for effectiveness and cost-effectiveness (i.e., amount of good accomplished per dollar spent) is sufficient to make us feel that more good is accomplished by giving to these charities than through direct cash transfers. VisionSpring is an internationally-recognized social enterprise whose mission is to ensure that everyone in the developing world has access to eyeglasses. Over the past decade VisionSpring has established proprietary distribution channels in India and El Salvador to provide Base of the Pyramid consumers with access to high-quality, affordable eye care services and products. Our Global Partnership program enables VisionSpring to leverage existing NGO networks, broadening the scope of our work while adding value to other organizations. VisionSpring has sold more than 1,038,000 glasses in 23 developing countries. 1. Can the organization provide compelling evidence that its program has significantly increased recipients' incomes or otherwise improving their quality of life? From 2007-2010, the University of Michigan conducted a rigorous impact evaluation on VisionSpring’s reading glasses intervention for Base of the Pyramid consumers. The William Davidson Institute led a team in Andhra Pradesh, India to conduct market testing of 466 individuals in need of reading glasses. The study established that a pair of VisionSpring reading glasses increases customer productivity by 35%. Further analysis by the VisionSpring team concluded that the use of reading glasses results in an average of 20% increase in monthly income. Multiplying conservative estimates of average daily income, working days per year, and expected life a pair of eyeglasses, VisionSpring calculates that each pair of glasses increases income by $216 for the two years of useful life of the glasses, or $108 annually. For this type of organization, we primarily seek evidence from randomized controlled trials. When we consider other evidence, we focus largely on the discussion of the counterfactual: i.e., what alternative, non-program factors may have caused the observed rise in incomes? It is difficult for organizations of our size to do RCTs because they are very expensive, RCTs can cost upwards of $500,000. The Mulago Foundation, well known for their commitment to impact evaluation, funded VisionSpring’s University of Michigan matched-control study that analyzed a control group of 205 and variable group of 261. 2. Can the organization demonstrate a track record of using charitable funds to create self-sustaining institutions without the need for charitable funding? VisionSpring expects to be operationally cost covered in El Salvador by the end of 2013. 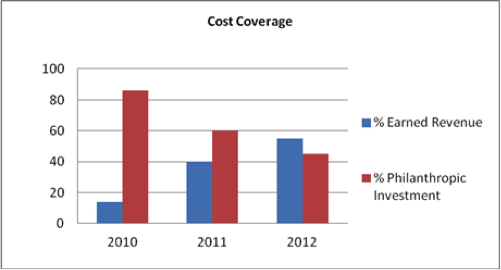 By the end of 2012 VisionSpring expects the organization with be 55% cost covered.